Canvasflow lets you make use of any standard "web safe system fonts" like Arial, Times New Roman, and Garamond. When a website or application is called up on that device using one of those system fonts, that device recognizes it and renders it no problem. But what happens when a designer wants to create a design with a custom or lesser-known font that’s not locally installed If that font isn’t installed on a device, it won’t display and you’ll lose the carefully designed branding and graphic design you put into your content. When a designer wants to use one of these custom fonts, they can use a web font, which is a font that doesn’t have to be installed on a computer because it’s accessible via a server where the file is hosted. From there, that font gets called up and loaded into the browser where it can be viewed how the designer intended. 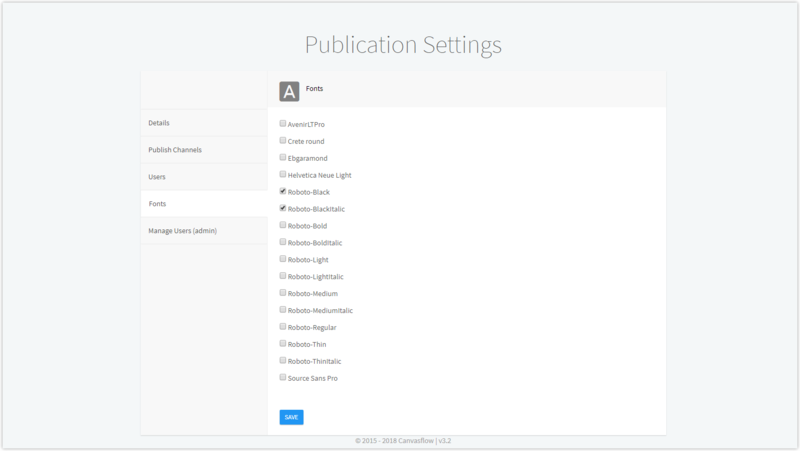 Canvasflow provides full support for custom web friendly fonts to be used within articles and served with offline versions of your publication. Custom fonts are managed on a per publication basis and must be manually added to your account by our admin team. To add custom font(s) to your publication, please email the font(s) along with the publication name to support@canvasflow.io. Our support team will convert and add the fonts to the specified publication. If you do not have a web friendly version of your font, please email the truetype version and we will do our best to convert it for you. Canvasflow does not support linking to the Google Font library as all custom fonts must be available to the user, even if they are offline.